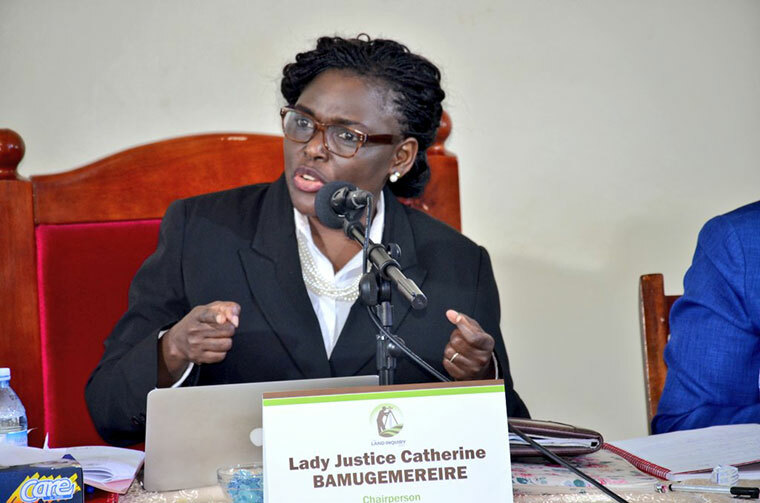 Justice Catherine Bamugemereire’s inquiry into land matters has failed to account for money used. The Commission of Inquiry into land matters is in spotlight over failure to account for Shs13 billion it received from the Ministry of Finance amid accusations of extravagant expenditure. Led by Justice Catherine Bamugemereire, the seven-member Commission was set up in 2016 to look into the effectiveness of the law and processes of land acquisition, administration, management and registration in Uganda following increasing land conflicts. They effectively began work on May 3, 2017. However, the manner in which the Commission spends money has raised eyebrows among officials from the Ministry of Finance, including the Permanent Secretary, Mr Keith Muhakanizi. Sources told this website that Mr Muhakanizi has refused to extend more money to the Commission until they account for the Shs13 billion. About two weeks ago, sources said Mr Muhakanizi, who is also the Secretary to the Treasury, blocked a request from the Commission for more Shs7 billion, until they provide accountability. When contacted, Ministry of Finance spokesperson Jimmy Mugunga confirmed blocking the request, saying the request for additional funding lacked supporting documents. “Best practice requires entities including the Land Commission to account for all public funds in time through their respective accounting officers,” Mr Mugunga said. This comes amid revelations of the huge allowances that the Commission officials receive.Sources said the commissioners are paid about $200 (about Shs720,000) per sitting and $690 (about Shs2.5m) per day whenever they travel abroad. The team has already been to Ghana, United Kingdom, and South Africa. In each country, they have spent about seven days, which translates into about Shs470m for the seven commissioners. However, Mr Elbert Byenkya, the land probe spokesperson, defended their expenditure, saying their countrywide investigations are very costly given the regional tours, the costs of hiring facilities for conducting hearings, cost of witness transport, witness protection and security, among others. He added that even for the last four months, they have had to work without any pay or allowances. He also claimed the accountability questions are being raised by people who have been stung by the probe. Following insistence, the Finance Ministry is said to have accepted to give them Shs2b but after providing accountability. The commission is expected to wind up their work on May 9 but still has backlog of about 4,500 complaints, which they are yet to address. In January, they handed over an interim report to the President after 120 days of public hearings. Several people, among them, government officials, local leaders and businessman have been grilled by the commission over various cases including land grabbing, murder, forceful evictions.